Gary Brooker was in a reflective thoughtful mood as we sat drinking half pints of bitter and eating giant ham salad rolls in a cosy little pub off London’s Charing Cross Road recently. ‘Our new record? I haven’t really got any thoughts on it. I suppose the same cynics who accused us of making Homburg a carbon copy of Whiter Shade of Pale will level the same jibe at Quite Rightly So We never expected our first record to be such a massive hit. Naturally we were very pleased, but it has become a yardstick by which all our records and stage performances are judged. I asked Gary why the Procol Harum are not seen in clubs and ballrooms nearly as much as their fans would wish. ‘The number of times we have appeared in front of our own fans is almost in double figures,’ he joked, wiping half a dozen tomato pips from his mouth. ‘Remember that fiasco at the Saville. That was the worst day in our lives. We had dashed back from Torquay and were just about ready to collapse. We had no time for rehearsals, we were all hungry, thirsty and feeling very uptight. And, of course, it was only the second or third time we had played together. ‘Suddenly the curtain went up, and there we were on stage. The theatre was packed with people who had come to see these five freaks who had appeared from nowhere with the record of the year and had shot straight to number one. Fair enough, that was then. But why, now that the Procol have got a good line-up and have been together for some time, do they persist in keeping a hundred miles away from live audiences? ‘That is a slight exaggeration’. Gary insisted. ‘We have played a few universities in the past couple of months, the Speakeasy and the Marquee. You must not forget that we have also toured America this year, and Germany with the Bee Gees. Then there have been frequent trips to France and Italy where for some reason we are the biggest thing ever. ‘But the main reason’, he continued, ‘why we don’t play in Britain as much as the fans, or ourselves for that matter, would like is that the venues where we can give of our best are very limited. ‘Corny as it may sound we do not play for the money. True, we have got to live, and there is no virtue in being a starving musician, but we get on stage and play because we have a sound we want people to hear, and if the hall or club is inadequate, we would rather not play at all than give an inferior performance. What, I wondered, did Gary have to say to reports that the Procol are a moody and unto-operative group? He thought for a few moments and took a large swig at his beer. ‘Unpretentious’, he replied. ‘That’s how I would describe us. I know I find it impossible to smile to order unless I have something funny to smile at. Groups like Dave Dee can fool around all day long and still have a smile from ear to ear. They are lucky, we can’t. But I am sure real fans would rather know the real Procol Harum than five idiots posing for photographs and giving funny quotes when they are not us at all. Are we to infer from the last sentence that Gary knows and worries about world events? ‘Look at the papers any day of the week. You can’t read one without reading of wars, riots and murders. There is not much any one individual can do about it, but that doesn’t stop you worrying. On a personal note. I asked Gary if it would not be more convenient for him to move up from Southend to London. ‘If you mean would I have to pay less fares, and spend less time travelling, of course the answer is yes. But I have lived for a short while in London and the smoke and fumes almost killed me. I love the peace and quiet, although Southend isn’t exactly a haven of tranquillity in the summer. ‘On a day off I can sit in my room and write to my heart’s content. In London there are too many distractions. I am not a very gregarious person. I can spend days without really talking to anyone. Just one or two close friends who I can trust implicitly are all I need. ‘Plus the fairies, pixies, and goblins. I’m not joking. I really believe in the little people, in re-incarnation and even in heaven and hell. ‘I am religious, but not in the sense that I pray and go to church. I am sure everybody has a sense of right and wrong, and I just follow my own ideas of the life I feel I should lead. ‘Religion is a very personal thing. You don’t need an awesome building and a preacher. In any case, they can’t put anything across to me. The church’s ideas are too far removed from present-day life. ‘If I had one wish, I think it would be to meet a ghost. Even if it were an unfriendly one, it would be a great experience. With that Gary had to dash off to do some recording. 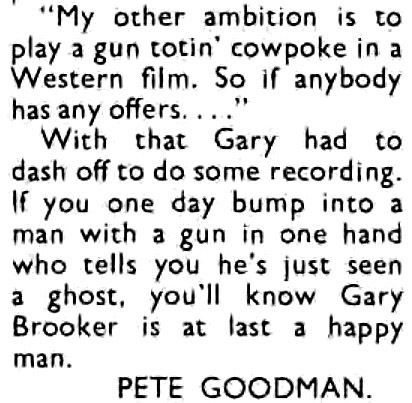 If you one day bump into a man with a gun in one hand who tells you he’s just seen a ghost, you’ll know Gary Brooker is at last a happy man.